On Sunday, the cruise ship Carnival Fantasy rescued 23 people from a small boat in the Caribbean after receiving a request from the U.S. Coast Guard. 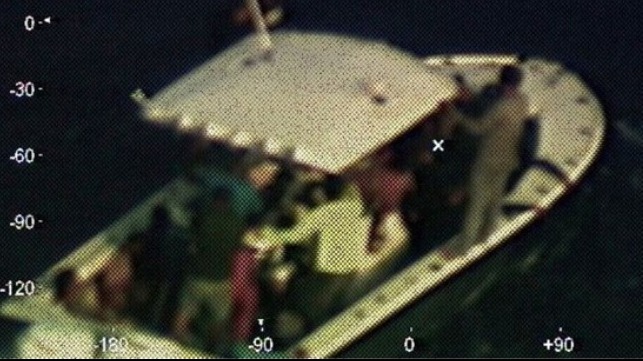 According to the Coast Guard, the occupants of the boat included 22 Cuban nationals and one Cuban-Mexican national. The Cuban nationals were refugees who had departed Cuba in a wooden boat, then lost power and drifted for three days. The Cuban-Mexican man encountered them adrift and brought them aboard his sport-fishing boat. This vessel also lost power, and the occupants drifted for another three days. Last weekend, a relative of one of the refugees received a satellite phone call from the drifting sport fishing vessel. The relative contacted the Coast Guard at 0115 hours Sunday to report that the group was in distress, and the USCG launched an aerial search effort. At about 0840 hours on Sunday, a Coast Guard Air Station Miami aircrew located the boat at a position approximately 130 nm off the coast of the Yucatan Peninsula. The USCG requested assistance from the Carnival Fantasy, and she diverted to the scene. The cruise ship reached the boat at about 0900 hours and brought the survivors on board by 1050. According to Carnival brand ambassador John Heald, the rescuees were confined to the crew’s quarters, and two received treatment aboard the ship for minor medical issues. Upon the Fantasy’s return to Mobile, the survivors were turned over to U.S. Customs and Border Protection and the Coast Guard Investigative Service. Carnival came in for criticism on social media after Heald announced the rescue in a Facebook post. He later deleted the post after some commenters protested the SOLAS requirement obligating masters to respond to vessels in distress.